OverviewGame Boy Wars 2 is a Turn Based Strategy game for the Game Boy Color. It is a Japan-only part of the Nintendo Wars series. 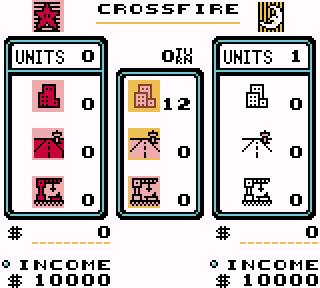 Game Boy Wars 2 is a simple but deep head-to-head wargame played on a hex grid. I call it a micro-wargame, in that it displays the core paradigms of the genre but carves the gameplay down to bare-bones mechanics so that full matches can be played in less than an hour. The game was designed to be played over the Link but at higher difficulties the AI can be an exciting opponent all the same. Players choose a map and start at a predetermined location with a home base hex and several "industrial hexes." These are where units can be purchased, at any time during a turn. There are a few other hex terrains including commercial hexes and port hexes, which can be occupied to provide the player additional turn income. For the most part the unit stats are intuitive- strength, moves, supply. But ranged units can get really confusing until you get used to them, because the listed weapon range doesn't apply to every direction and there's no graphical indication of where it DOES apply. Other units cannot attack under certain conditions that also are not indicated graphically. Overall Game Boy Wars 2 has just enough depth and variety to make for an occasional and enjoyable micro-wargaming session during your lunch break or on the train home from the office. TransBRC's English translation is polished and precise. Now you can add videos, screenshots, or other images (cover scans, disc scans, etc.) for Game Boy Wars 2 (Japan) [En by TransBRC v1.02] to Emuparadise. Do it now! If you haven't noticed yet, we have a retro game of the day feature (top-right of the screen) wherein we feature a new retro title every single day! Now, you can vote for your favorite games and allow them to have their moment of glory. Click on the button below to nominate Game Boy Wars 2 (Japan) [En by TransBRC v1.02] for Retro Game of the Day.